These Mini Gluten-Free Pineapple Upside-Down Cakes are also known, in these here parts, as my other most-favorite-dessert in the whole world…they are in close contention for first with the elusive Black Forest Cake. I warned you last week this recipe was coming. I also warned my hips that I would have to test it again…just to make sure it was perfect for you all, my wonderful readers and friends. The gluten-filled version of this cake was a regular staple in my grandma’s baking repertoire. I remember her making it for so many wonderful food-filled family gatherings. I also remember picking off all of the pineappley, buttery, brown sugary caramelized topping when no one was looking and then trying to smooth it over to make it look like my fingers had not yet found all of that deliciousness. My grandma always knew…but she never got mad. After all, this is the same lady that would spend twenty minutes hand-stirring my bowl of strawberry ice-cream until it was the perfect soft-serve consistency. She liked her grandbabies happy. And one of the best ways she knew how to make us happy was with the attentive love she put into all of our food. When I converted her recipe to a gluten-free, and slightly healthier, version, I also changed it so that it was actually baked in individual ramekin dishes. It was easier to control myself when I knew I had a specific serving size…as long as I could control myself to only one per sitting. This recipe is for 4 eight-ounce ramekin dishes (actually there is just enough batter to squeeze out 5). This is only because I only have four left amongst my kitchen supplies. Because I use these versatile little gems for so many different things…ice cream bowls, condiment holders, mise en place containers…my supply has started to dwindle. Somehow, I manage to break these more often than I break my wine glasses, which says a lot considering how regularly I tend to use those as well. But, if you happen to be a bit more careful with your kitchen supplies than I, then feel free to just double this recipe to fit your nice collection of eight ramekins. 1. Preheat oven to 350 degrees. Lightly grease 4 Oven-safe Eight-Ounce Ramekins with Coconut Oil. Sprinkle 1 1/2 tsp of Coconut Palm Sugar (or Brown Sugar) into bottom of each ramekin. Then place pineapple pieces around the bottom (like above photo). *Note: You may want to use more pineapple than above photo. I was running low on fresh pineapple when I made these. I typically like a lot more than I had on hand. 2. Pour 1/2 Tbsp of melted butter (or Coconut Oil in liquid form) into each ramekin. Place ramekins into oven for 5 minutes until butter starts to bubble. Carefully remove ramekins from oven. 3. In a medium bowl, whisk together until airy: Superfine Brown Rice Flour, Millet (or Almond Flour), Arrowroot Starch, Baking Powder, Baking Soda, and Sea Salt. 4. In bowl of stand mixer, add: Softened Butter, Coconut Oil, and Sugar. Beat on medium-high for 3 minutes until becomes light and fluffy. Add egg (or Egg-replacer) and vanilla. Stop to scrape down sides. 5. Add half of the flour mixture, then all of the buttermilk (or dairy-free substitute), then the rest of the flour mixture and mix until just blended. 6. Pour batter into hot ramekins, only filling 2/3 full (note, you may have a little extra batter). Bake for 20 minutes, or until toothpick comes out clean. Let cool for ten minutes, run knife around edges, then remove from mold and flip onto serving plate. Serve with your dairy or dairy-free choice of vanilla ice-cream. Do you have a favorite cake that reminds you of your childhood? Oh man, those are way too cute. I’m not sure I have the right-sized ramekins though. Hmm, I’ll have to think up a way around that. These look amazing! I love that they have such a sweet spot in your heart and memories too! Those make the best desserts, especially when you can make them fit into your restrictive diet! Sweet, sweet, sweet, sweet! OMG, those are cute, and I love the idea of individual ones. I think those would make guests feel really special. Love this post, Kim! Oh, and good grandmas are so very special. 🙂 Your grandmother made me think of my favorite grandma who spoiled us rotten and NEVER got mad at us. Seriously. Such grandmas are true blessings in life. Shirley, you are too sweet! I do have to agree that whenever I have served these, everyone loves the idea of the small individual ones. I love that you have a grandma that spoiled you as well! That truly makes for the most amazing memories! My grandma (and my mom, of course, who learned from my grandma) is the reason that I love to spend so much time in the kitchen! I love making desserts in individual ramekins. It really helps keep us “honest” with our portions! Your pineapple upside down cakes look yummy. Can you give me a clue how to substitute millet flour? You can substitute quinoa flour, oat flour, or corn flour in place of the millet flour. All should work well in the same measurement amount! Let me know if you have any questions about it! I found mini tube pans & made some gluten-free Pineapple Upside down cakes that way, but each one is definitely two servings. I also put pecans in the bottom, like pecan rolls have. Had to leave out the maraschino cherries to avoid corn derivatives. What can replace the Rice Flour????????? Suppose you don’t own ramekins, could you make this in say, a cake pan or pie plate? Why does your food always look so darn perfect? I’m always in awe. I’m going to fly to AZ to get some food styling tips from you and soak up some much-needed sun! I’m not a big cake person (I know, I know), but these I would love. I am so the person who picks off the caramelized stuff and then tries to cover my tracks, that is the best part! I also make apple crisp with a triple layer of crisp. I just love that really sugary stuff. Alisa, I totally guessed you would be the one who also picked off all of the good stuff on top! LOL And I also make my crisps and crumbles AND my coffee cakes with TONS of topping as well for the same reason! These look so cute and delicious! To keep to the cake “one per sitting” rule, I would sit down, eat one, get up, sit down again and have another! haha. I have a confession to make. I read your blog all the time but never comment, however, thats not the confession i meant. My mother in law makes pineapple upside down cake all the time and when Im over there I just cant resist myself when i’m alone in the kitchen; sneaking bites out of the pan and trying to cover it up. haha however, the being sick part afterwards always clues everyone in that I was the one who ate half the pan!! I always feel like a little kid who is caught with their hand in the cookie jar! The pretending like gluten and dairy isn’t a problem has finally become something I can’t justify anymore and has had me searching for the perfect gluten free and vegan pineapple upside down cake and I am soooo happy that you have created it! You truly are a blessing! And I LOVE that you too were a “topping thief”! 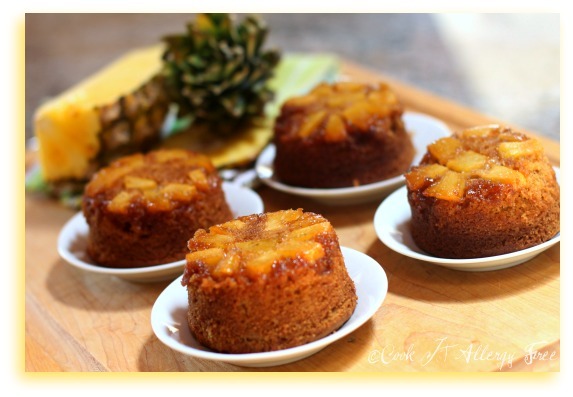 Pineapple Upside Down topping is totally addicting! I hope you are feeling better now that you are gluten and dairy free! 😉 I also hope you enjoy the cake! 😉 Thank you for your kinds words! I made the vegan version of this recipe. The “egg” mixture is a good idea, but I think it needs some xanthan gum in the flour or some ground flaxseeds if you don’t use the real egg; mine prettymuch all fell appart when I tried to take them out. I’m in love w/ the flavor though! I unfortunately couldn’t resist stuffing all the crumbles into my mouth… And I doubled the recipe… So there where a lot of crumbs. Another idea to veganise it is to use pineapple juice instead of buttermilk. Hi, I see that this receipe is gluten free, our family doesn’t have this restriction, do you know how the receipe would change if it was converted with white flour? Also, you have an interesting mix for egg replacement, does this work better for baked goods in general, or is it specific for this recipe? Eggs (amongst other things) are on our DON”T eat list, and I am always looking for new ways to better my baking. Thanks, this is a great site! I just came across your blog after a search and I’m loving it! This recipe looks fantastic and I can’t wait to try it out!! I know my kiddos would love it. Do you have another suggestion for replacing buttermilk? I cannot find coconut milk yogurt here in Canada (although I SO wish I could!) Do you think coconut milk with lemon juice would work? Hi Krista!! You can actually just use coconut milk and lemon juice in place of the coconut yogurt. If you use the canned full-fat coconut milk it will definitely mimic the consistency of the yogurt and the added fat from the milk will just add a richness to your cake! Hope you enjoy it! This is a fabulous recipe! Rice, eggs and pineapple are on our “don’t” list along with gluten and dairy so, I substituted fresh mango for the pineapple, buckwheat flour for the rice and 2T ground flax cooked with 5T water, until egg white consistency. Also, I didn’t have the coconut sugar so I subbed with maple flour. It’s delicious, doesn’t taste “healthy,” and only tastes a bit oily. I forgot the extra 2T flour that is recommended when replacing the rice flour. Hi Stephenie! Thank you so much for letting me know how the recipe turned out! So glad that all of your substitutions worked out so well here! I love it! Glad you enjoyed the cakes!! We love these as mango upside down cakes. I’ve made this every week since we started our restrictive diet a month ago. The way I make it it’s sugar free, grain free, egg free, gluten free and dairy free but fully fabulous thanks to u! Thank u for sharing this recipe! Stephenie, I am loving your adaptions to the recipe! I am so happy you are enjoying the upside down cakes. The idea of the mango sounds awesome!! Thanks for coming back and letting me know about your results!! 🙂 I just may give your version a try next time!! I made this for my family, for once we could all enjoy the same desert – only one person in our family is gluten intolerant. It was such a hit that I have had requests to make it again and again. I made these tonight, and tweaked them just a little and cooked them as a doubled recipe in a muffin pan. They are BEAUTIFUL!!! Thankyou so much for a recipe that works! I just made these tonight. Fabulous! Thanks to the coconut sugar- I have no sugar high afterward either. 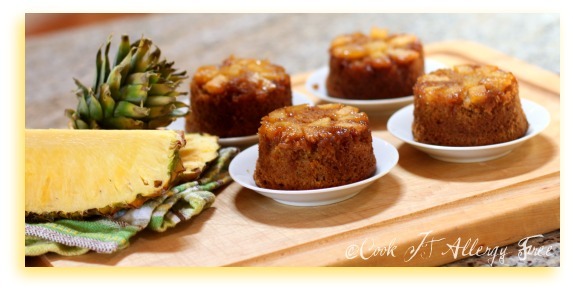 I doubled the recipe since I used my 6 cavity mini pineapple shaped baking pan from nordic ware. My only error was that they could have baked just a bit longer. They tested fine with the touch method and a toothpick but as so often happens with GF baking, that wasn’t accurate enough. Hi Jenny! Thank you, thank you for coming back and sharing your success with these! So excited to hear that these turned out for you. I love the idea of using the juice from the pineapples for some of the extra flavor! I am going to do that next time too! 😉 And I agree that in GF baking that touch test has failed me many times. That, I think, is the trickiest part of baking with substitutions. It can be so tricky to know when something is done! Hi! I’d love to make this for my best friend’s birthday which is next week, but I’d like to make her a double layer cake. Do you have a recipe that would be translated to an 8″ round rather than cupcakes?